Adobe Books Backroom Gallery is pleased to support SF Camerawork's First Exposures, the mentoring program that provides free weekly photography classes for under-served youth. 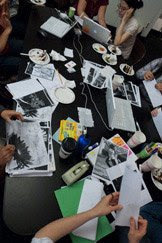 This Spring the students of First Exposures explored the world of alternative publishing and visual storytelling by creating their own 'zines. Join us to celebrate and view the 25 different original 'zines on display. Calling all Friends of Adobe Books! On Monday, June 1st Adobe Books will be cleaning up the store from 8am to 8pm. The store is seeking a few willing and able friends to help clean, sort, organize, pack, unload, recycle, and throw-out. Lunch and snacks will be provided. If you're interested in helping out please email Devon at adobebooksbackroom@gmail.com and let us know what your availability is that day.